This recent post includes some great examples of how a repository can add extra value to researchers who want to expose/promote their research. I have the pleasure of seeing my son Conor on campus at UPEI on a regular basis. He is a 1st-year student who is enjoying the stimulation of a university environment. 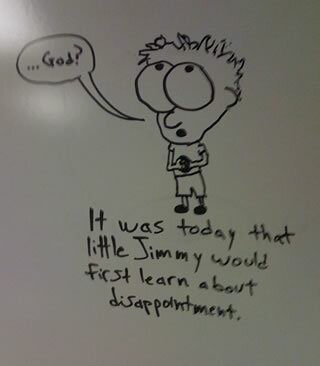 He also enjoys doodling and exercises that itch by drawing a comic on my office whiteboard a couple of times a week. I look forward to walking in to my office and seeing his latest creation, so I thought I would share them via my blog. Here is the 1st one I managed to capture. Some very interesting and topical sessions from the recent ARL/CNI Fall Forum. The sessions hit on a number of the key issues highlighted in the recent special Nature issue on Bog data, including how libraries can respond to the opportunity, how we educate the future data curation workers and more.